Lidar sensors on UAVs capture imagery which only a few years ago needed an aircraft carrying large heavy lidar sensors and a crew to accomplish. A lidar sensor mounted on a UAV, along with sophisticated photogrammetry software can process lidar images very quickly in the cloud, allowing for effective decisions to be made by stakeholders and relevant parties. The drone lidar sector is growing rapidly and especially over the past few years. In only a short period of time, manufacturers of the best aircraft lidar sensors have engineered lidar sensors for small drones. The output from these UAV lidar sensors is outstanding and will keep improving as more manufacturers enter this sector. Over the coming years, we are going to see most of the lidar sensor work moving from aircraft to UAVs. In this up to date post, we look at 12 of the best lidar sensors for small unmanned aerial vehicles. These lidar sensor manufacturers are Velodyne, Routescene, Leddartech, Riegl, YellowScan and Geodetics. We also discuss some of the many great uses of lidar technology and how each lidar sensor works well in different sectors such as mining, forestry, surveying, corridor mapping etc. There are so many terrific uses for drones including drones mounted with lidar sensors. Here is an excellent article which shows you all the many uses for drones to date. Lidar – Light Detection and Ranging or Lidar is a remote sensing technology where the environment is scanned with a pulsed laser beam and the reflection time of the signal from the object back to the detector is measured. The Time-of-Flight (ToF) reflection time measurement can be used over distances from one meter up to several kilometers. To increase the range of lidar systems, very short laser pulses in the invisible Near Infrared range are used. These enable a far higher laser power compared to continuous wave lasers, while still complying with eye safety requirements. During the scanning process, the lidar system will gather individual distance points within an aggregate of points, from which 3D images of the environment can be computed. The laser scanners deflect the laser beam using deflecting mirrors, which enable them to achieve very wide fields of vision (FoV). Most of the latest UAV lidar systems can rotate around their own axis and offer 360 degree visibility. Modern devices achieve very high data rates with over one million distance points per second. Within a lidar sensor, a number of independent elements are integrated into a single device and will generate critical ranging data for safe navigation along with precise positioning. Lidar sensors have obstacle detection capabilities over a wide field of view, which make them ideal as part of a sense and avoid solution. Lidar is the leading technology for automobile collision avoidance and also in driver-less cars. 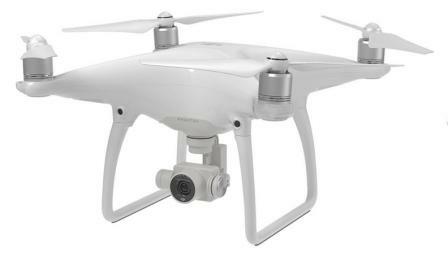 Collision avoidance technology has now moved across into the consumer drone sector with the highly innovative DJI Phantom 4 Pro (using 2 Ultrasound sensors and 4 monocular sensors) and the Yuneec Typhoon H Pro (uses the Intel RealSense R200 3D camera) now with collision avoidance. The latest lidar sensors have integrated optical altimeter technology which deliver accurate distance measurements above ground level while meeting size, weight and cost requirements of UAV manufacturers. 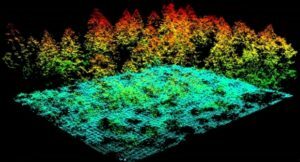 Agriculture and forestry use lidar to inspect vegetation such as leaves and crops. Also, the above ground imagery (for example forest canopy) can be removed to view the ground surface area. The best lidar sensors have powerful built-in signal processing, large field of view and multi-segment measurements which generate critical distance data and efficient obstacle detection, which enable safe navigation when performing structural inspections. Lidar sensors also described as laser scanning will work in low contrast or shadowy situations, even at night. Now, sometimes you might hear people talk about Flash Lidar. Time-of-Flight cameras sensors are often referred to as Flash Lidar. But there are big differences in the technology and its uses. ToF is scannerless, meaning that the entire scene is captured with a single light pulse, as opposed to point-by-point with a rotating laser beam. Time-of-flight cameras capture a whole scene in three dimensions with a dedicated image sensor, and therefore has no need for moving parts. ToF has so many great uses. Here is a terrific article giving you all the information on ToF cameras and best uses. The below lidar sensors were designed and engineered for small UAVs. Use the web links to each lidar sensor for more information. Each of the manufacturer have excellent websites which will give you full data sheets along with the best uses for their lidar sensors. The LeddarTech Vu8 is a compact solid-state lidar which provides highly accurate multi-target detection over eight independent segments. Detecting targets at up to a 215 meter range and weighting only 75 grams, the Vu8 delivers nearly twice the range for half the volume compared with the Leddar M16 from which it inspires. The Vu8 uses a fixed laser light source, which significantly increases the sensor’s robustness and cost-efficiency. The Vu8 has a high tolerance to noise and interference. This means it is unaffected by other sensors’ signal, by lighting conditions including direct sunlight, and it provides reliable detection in various weather conditions including rain and snow. The Vu8 sensor is particularly suited for navigation and collision avoidance applications in driver-assisted, semi-autonomous and autonomous vehicles, such as drones, trucks, heavy equipment for construction and mining, shuttles, buses and other public transportation vehicles. Applications such as Advanced Traffic Management System (ATMS) requiring longer ranges as well as wide fields of view will also benefit greatly from the new Vu8 sensor. This LeddarOne lidar sensor is a full-beam sensor module which is entirely dedicated to a single point measurement which makes it ideal for applications such as level sensing, security and surveillance, drone altimeter and presence detection. The LeddarOne can be easily integrated into almost any system. The module’s compact size, low power consumption and high accuracy gives developers and integrators great flexibility to enhance their own products. You can read more on the LeddarOne here which, includes full specifications and the many uses for this small compact lidar sensor. This 1st video also shows you what the LeddarOne is used for and how it works. 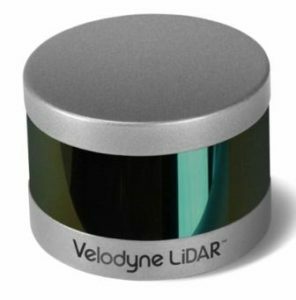 Velodyne Lidar now provides a full line of sensors capable of delivering the most accurate real-time 3D data on the market. Their sensors are developed to create a full 360 degree field of vision environmental view for use in autonomous vehicles, industrial equipment, 3D mapping and surveillance. Velodyne have 3 lidar sensors for UAVs. The HDL-32E LiDAR sensor is small, lightweight, ruggedly built and features up to 32 lasers across a 40 degree vertical field of view. The HDL-32E measures only 5.7″ high x 3.4″ in diameter, weighs less than 2 kg and was designed to exceed the demands of the most challenging real world autonomous navigation, 3D mobile mapping and other lidar applications. Velodyne’s new PUCK™ VLP-16 lidar sensor is the smallest, newest, and most advanced product in Velodyne’s 3D lidar product range. It is more cost-effective than similarly priced sensors and developed with mass production in mind. It retains the key features of Velodyne’s breakthroughs in lidar: Real-time, 360 degree horizontal FOV, 3D distance and calibrated reflectivity measurements. Velodyne LiDAR’s Puck LITE™ is a lighter weight version of the VLP-16 PUCK for applications that demand a lower weight to meet their requirements. The Puck LITE™ has identical performance to VLP-16 with the only difference in weight of 590 grams (1.3 lbs) versus 830 grams for the VLP-16. No other changes have been made to the Puck LITE™ as it retains its patented 360 degree surround view to capture real-time 3D lidar data which includes distance and calibrated reflectivity measurements. 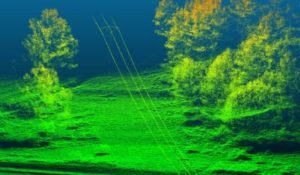 Here is a terrific video which explains how lidar is being used and what the Velodyne lidar sensors can do. Expanding on Velodyne VLP-16, the Puck Hi-Res is used in applications which require greater resolution in the captured 3D image. Puck Hi-Res retains the VLP-16 Puck’s 360° horizontal field-of-view (FoV) and 100-meter range. However, the Puck Hi-Res also delivers a 20° vertical FoV for a tighter channel distribution with 1.33° between channels instead of 2.00°, giving greater details in the 3D image at longer ranges. This will enable the host system to not only detect, but also better discern, objects at these greater distances. Laser scanning utilizing high-end unmanned airborne platforms provides the possibility to acquire data in dangerous and/or hard to reach areas, while offering an excellent cost to benefit ratio for numerous applications, e.g., precision farming, forestry, and mining. For years, Riegl Airborne Laser Scanners have been successfully used in powerful unmanned airborne platforms. With the VUX-1UAV airborne scanner and the RiCOPTER which is Riegls’s remotely piloted aircraft system for Unmanned Laser Scanning (ULS), Riegl have revolutionized the commercial and civil market with its advanced systems. The Riegl VUX-1UAV (former VUX-1) is a very lightweight and compact lidar laser scanner, meeting the challenges of emerging survey solutions by UAS/UAV/RPAS, both in measurement performance as in system integration. With regard to the specific restrictions and flight characteristics of UAS, the Riegl VUX-1UAV is designed to be mounted in any orientation and even under limited weight and space conditions. It is modest in power consumption with the instrument requiring only 1 power supply. The entire data set of an acquisition campaign is stored onto an internal 240 Gigabyte SSD and/or provided as real-time line scan data via the integrated LAN TCP / IP interface. This next video shows the Riegl’s ready to fly UAV laser scanning system which is equipped with the survey grade VUX-1UAV lidar sensor. The Routescene UAV LidarPod is a complete turnkey system developed specifically for use on UAVs. This company worked with the surveying industry and it’s their expertise which is behind the Routescene UAV LidarPod. Routescene designed a reliable, practical and cost-effective solution for lidar applications. The UAV LidarPod is a robustly engineered and self contained system. It is simple to operate and enables rapid deployment in the field. The turnkey solution includes LidarViewer which is the specialized software to handle the resulting data. The LidarPod sensor combines the best technology on the market to capture survey grade positional accuracy together with a very high point cloud density. The Routescene LidarPod will collect 700,000 points per second, which at an altitude of 40 meters (131 feet) and flying speed of 30 km per hour (18.64 mph) equates to 300 points per square meter. This offers a fantastic richness in the data set which greatly enhances the detail which can be collected. The Routescene UAV LidarPod total weight is less than 2.5 kg (5.5 lbs). This low weight will enable a 20 minute flight duration, the typical time required to perform a survey, allowing coverage of 1 square km on a single set of batteries. The Routescene UAV LidarPod contains all you need to collect precise survey data, quality control the data in real-time and create a very dense and accurate georeferenced point cloud. This means everything you need is built into the system including the lidar sensor, GPS / INS, radio telemetry, data storage and power management. No external components are necessary which eliminates the possibility of integration issues and loose connectors. The internal firmware controls the sensors, parses the raw data and transmits data samples to the Routescene Ground Station; it also manages and monitors power consumption of the LidarPod. Routescene have developed specialized software called LidarViewer, which enables you to easily import, visualize, and apply filters to the large volume of data you collect in a smart way, enabling the use of GIS and CAD packages thereafter. A state of the art integrated Real-Time Kinematic (RTK) GPS and Inertial Navigation System (INS) provides accurate position, velocity, acceleration and orientation under the most demanding conditions. The dual antenna moving baseline Real Time Kinetmatic (RTK) GNSS solution ensures that the LidarPod can achieve the highest accuracy possible for the lowest weight. The GPS\INS sensor combines temperature calibrated accelerometers, gyroscopes, magnetometers and a pressure sensor with a multi channel RTK GNSS receiver. These are coupled in a sophisticated fusion algorithm to deliver accurate and reliable navigation and orientation. Triple-frequency GNSS receiver that provides up to 1 cm accuracy positioning and supports all of the current and future satellite navigation systems, including GPS, GLONASS, GALILEO (European Satellite Navigation System) and BeiDou (Chines Satellite Navigation System). It also supports the Omnistar service for hassle free high accuracy positioning. A specially designed and tested solution for mounting the LidarPod and 2 GPS antennas onto your rotary UAV. The mounting kit includes an equipment plate which is compatible with 12 mm diameter UAV equipment rails, the 2 rails being 160 mm apart. The equipment plate includes quick release clamps for easy deployment. YellowScan design and develop ultra compact and lightweight lidar 3D laser mapping and aerial remote sensing solutions for drone deployment in industrial & scientific applications. 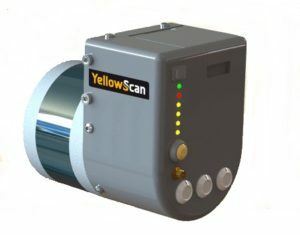 Scanning Vegetation & Crops: YellowScan’s technology is one of the few to get true distance to vegetation in near real-time. Scan fast growing vegetation and crops as frequently as needed. Security: YellowScan UAV mapping allows for quick and complete acquisition while eliminating manned airborne or on the ground logistics. High range for higher security on uneven landscapes and vegetation. Survey grade precision and accuracy. Turn-key and simple to operate. Fully autonomous, can be mounted quickly on any drone. Accuracy : 2.5 – 5 cm depending on IMU. Laser scanner frequency : 100 kHz. 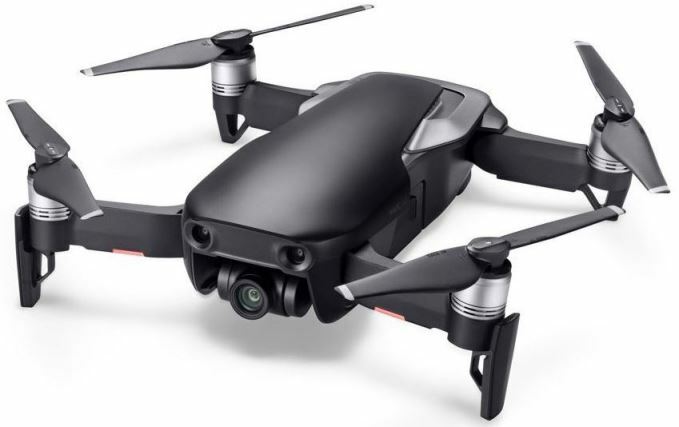 Weight : 2.5 – 3 kg battery included (5.5 – 6.6 lbs) depending on IMU. Size (mm) : L330 x W120 x H150. The YellowScan Mapper lidar sensor is a lightweight turn key surveying solution for drones and other ultra-light aircraft. It’s a small size and ultra-light weight allow it to be mounted on most UAVs. The YellowScan Surveyor is one of the lightest and most accurate lidar sensor solutions for Civil Engineering & Mining professionals. This YellowScan Lidar UAV surveying solution has the highest level of accuracy and density which is also capable of producing real-time georeferenced point cloud data. YellowScan Surveyor is a fully integrated system designed for the most demanding of terrains. The YellowScan Surveyor is quick and easily adapted to any drone. Now, the YellowScan Surveyor does not replace the YellowScan Mapper mentioned above, but complements the YellowScan Mapper with a solution ideally suited for precise topography and demanding requirements for civil engineering and mining applications. Leica Geosystems are renowned for the Imaging and Lidar sensors. Their Lidar systems offer high accuracy due to their best-in-class performance in pulse and scan rate. Leica ALS80 Airborne Lidar Sensor: It’s a high performance airborne sensor for urban mapping and utility corridor surveys. The weight of the ALS80 is 47kg (103 lbs) so it really is an manned aircraft lidar sensor or a large heavy payload UAV. I would expect Leica to start designing small UAV lidar sensors in the near future. They have all the technology and this market is growing massively. Geodetics was founded in 1999 by a team of scientists with the goal of providing precise positioning technologies in the civilian market. Since that time, Geodetics has grown into a product and integrated solution provider for Positioning, Navigation and Timing systems for a wide range of civilian and defense applications. Their products and systems have been deployed in mission critical applications including Aerial Refueling, Aerial Combat Training, Intelligence, Surveillance and Reconnaissance, UAV’s, Aerostats and Dismounted Soldier tracking. The Geodetics Geo-MMS SAASM is a fully integrated lidar mapping payload for integration with small unmanned vehicles. The Geo-MMS system includes an inertial navigation system, utilizing a SAASM GPS sensor with a path to M-Code, coupled with a lidar sensor. Raw data from the integrated GPS, IMU and lidar sensors are recorded on the internal data recording device and can be post-processed using Geodetics’ lidar tool software package to directly geo-reference the lidar point clouds. The Geodetics Geo-MMS is a fully integrated lidar mapping payload for integration with small unmanned vehicles. 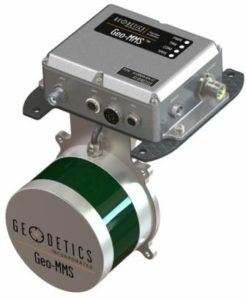 The Geo-MMS includes an inertial navigation system coupled with a lidar sensor. Raw data from the integrated GPS, IMU and lidar sensors are recorded on the internal data recording device. They can then be post-processed using Geodetics’ lidar tool software package to directly geo-reference the Lidar point clouds with LAS format output. Geo-MMS is available with a wide range of sensors. Here a quick overview of Geodetics products at the AUVSI’s Xponential.